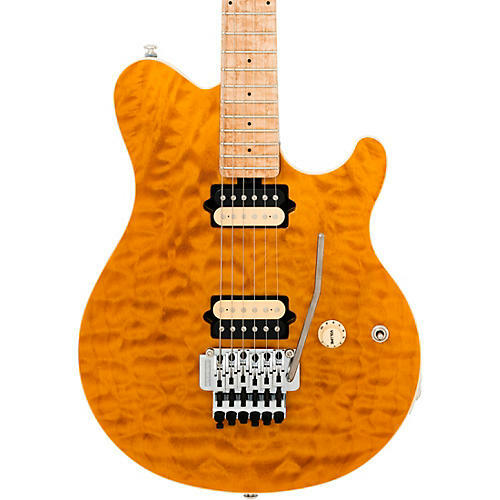 Beautifully crafted and exquisitely playable.This Music Man Axis guitar features a basswood body with a bookmatched figured maple top for a truly elegant look. The select maple neck is attached with five bolts for ideal alignment and stability. The neck joint is sculpted and neck plate flush mounted to facilitate smooth access all the way up the fretboard. Loaded with a pair of custom DiMarzio humbucking pickups with 3-way switching. Also features Schaller tuners with pearl buttons and Music Man Floyd Rose-licensed locking tremolo (lowers pitch only). Includes a Music Man hardshell case. Join the legacy of influential Ernie Ball Music Man Axis players. Order today.